Glen and Tyler are young, in love, and the wealthiest human beings on the planet. But when Glen's brother calls from a jail in Paris, they're off to France to tangle with spies, neo-Nazis, evil world-spanning conspiracies and French gangsters. Plus they have a romantic dinner, and find long-lost treasure. Really, it’s a fun-filled non-stop romp. Glen & Tyler's Paris Double-cross was a Finalist in the Rainbow Awards for 2013. 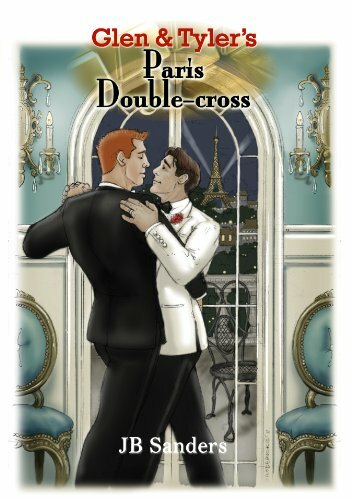 The back cover illustration for Glen & Tyler's Paris Double-cross, which only appears on the hardcover edition.